IBM® Common Data Provider for z Systems® is a collection of software programs that rapidly centralize IBM z/OS® operational data and feed it to analytic platforms. It accesses and distributes data in near real time and batch modes and defines multiple data collection sources (140+ data sources are supported including all standard SMF records plus syslog and applications log types like CICS®, IMS™ and more) and destinations. Click on demo button below to test the Splunk tool for yourself. Then click on the Resources tab to check out another sample dashboard that visualizes IBM Z® IT operational data on the Elastic Stack (formerly ELK Stack). Load SMF data directly into IBM Db2® Analytics Accelerator (IDAA) to reduce CPU processing and storage requirements. Balance CPU usage by using reclaimed space or space from non-production systems. Access available near real-time data for an ongoing health check of your enterprise and identify an early warning system with predictive analytics tools. 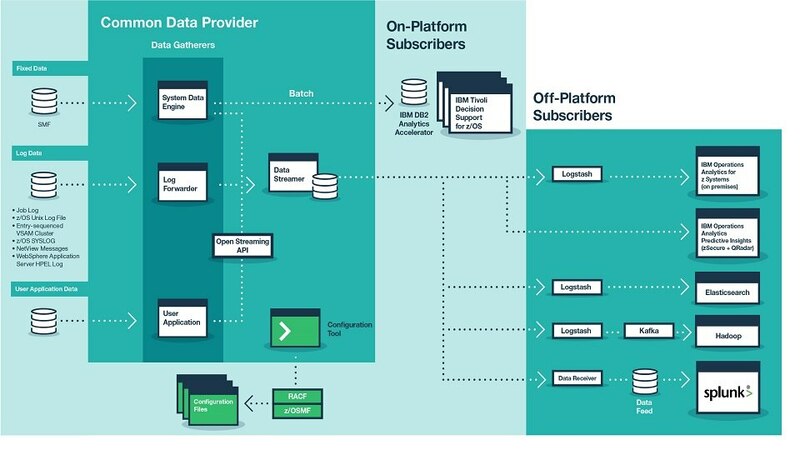 Supply data to IBM analytics solutions or the analytics platform of your choice, including Splunk and ELK. Send data to multiple destinations in different formats for different consumers—or filter to send only the required data to authorized consumers.